If you’re always in the kitchen, you know exactly how important a knife is. A quality one can simplify your cooking preparation needs ten-fold. Did you ever take a look at a chef’s hands? Some look like they’ve been lifting weights in the gym or working in the rugged outdoors due to their callus-ridden exterior. That’s what happens when you’re chopping all day. A company called NextGen Knives noticed the problem. As it turns out, knives aren’t actually designed for chefs’ preferred chopping technique. While most people wrap their whole hand around the knife’s handle, chefs pinch the base of the blade with their thumbs and index fingers. The way the blade and handle fit together just wasn’t designed for that kind of grip. NextGen didn’t just decide to design and mass produce a new line of knives. Instead, they leveraged advancements in metallurgy, chemistry, and 3D-printing technology to develop cutlery that is fitted for chefs. Here’s how they did it. NextGen spent the last year studying the way people hold their knives. (Yes, a year is a long time to watch people cut food.) Then they implemented laser scan data to create an ergonomic design and, finally, took on the 3D-printing component. 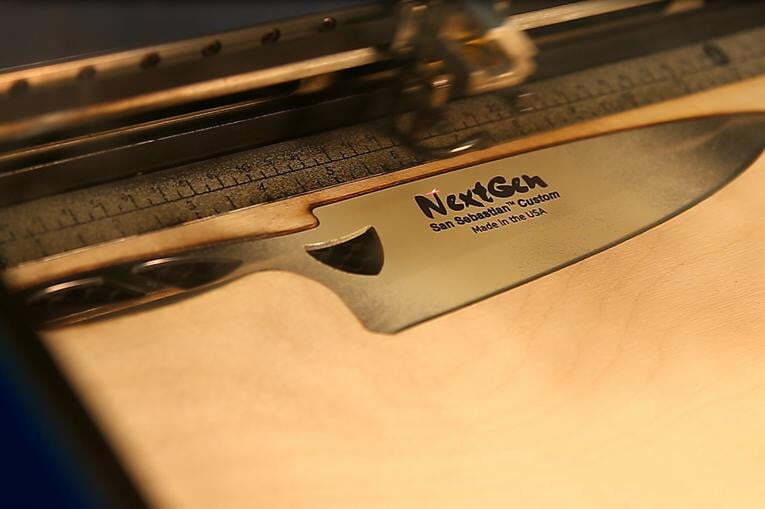 NextGen also partnered with knife-steel manufacturer Carpenter Technology Corporation to create a metal that is corrosion-resistant, hard but flexible, and sharpens easily. How do you get your own 3D-printed custom knife? NextGen just launched a Kickstarter campaign, so you can purchase one of its San Sebastian custom knives for $550. (You can get a non-customized version for $99.) Then you’ll have to scan your cutting hand onto a desktop flatbed scanner and e-mail it to NextGen. They’ll handle the rest. NextGen is offering a variety of different styles and colors of the San Sebastian knives, as well as a tough, puncture-resistant sack to store it in, since it won’t fit into a traditional knife-holder.